Top Rider New Year Resolutions! 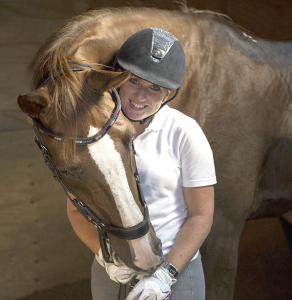 Dressage stars will light up the Liverpool International Horse Show stage at the iconic Echo Arena on the opening night of the equestrian and family extravaganza. 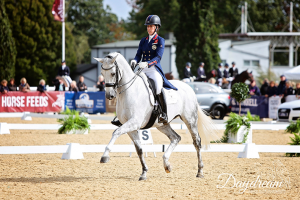 As well as the legendary Charlotte Dujardin competing in the Equitop Myoplast sponsored Inter 1 Freestyle – Dressage to Music class, leading names Sophie Wells, Nikki Barker, Amy Woodhead, Ulrik Molgaard, Katie Bailey and Kate Lister will be riding at their best to take the coveted title. Britain’s finest, Carl Hester will also be in attendance at the show for a meet and greet, as will the iconic and record-breaking Valegro for a parade and celebration of his amazing success. 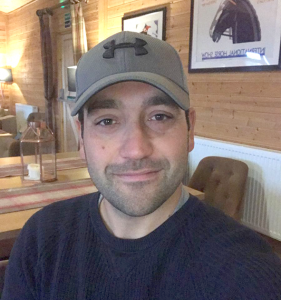 Said Liverpool International Horse Show, Dressage Consultant, Richard Davison: “The show is one of the most exciting on the international calendar and it is great to have dressage back for a second year. Added Liverpool International Horse Show President, Nina Barbour: “We are delighted to be bringing dressage to the show once again and to have Charlotte and her fellow competitors at the event is just fantastic. 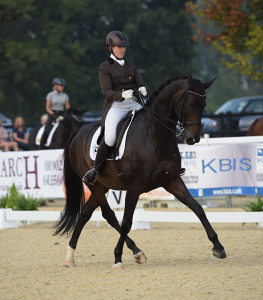 “The sport of dressage has grown beyond recognition and we are looking forward to watching some of the most talented and up and coming dressage horses in the country as they work towards Grand Prix. As well as dressage on the opening night, 28th December, for those visitors making it a New Year to remember they can look forward to a showjumping feast on New Year’s Eve, December 31, with the prestigious Theraplate UK Grand Prix one of the highlights, when leading names will battle it out to take top honours. This year’s Liverpool International Horse Show will see a host of leading names in action from 28th to 31st December, at The Echo Arena on Liverpool’s iconic waterfront. For most horse owners, one or two major health issues in their horse would be enough to put an end to any horsey plans and dreams but for one exceptional horse leading the All The Queen’s Horseson the London New Year’s Day Paradeon the January 1st, his story is pretty incredible! Currently, sound, happy and in good health (which his owner Jane says is probably down to her having a bad back and being unable to ride) Midas, is looking forward to being the centre of attention and leading the entire parade along the streets of London. 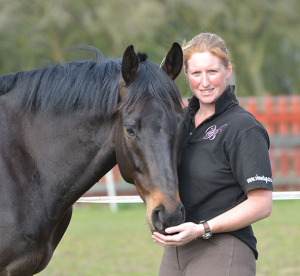 “He’s stressed me out like no other horse I’ve ever owned but I love him dearly, and I wouldn’t change a day I’ve had with him, and I hope I have many more years with him,” explains Jane. You can catch a glimpse of Midas, and the rest of the fabulous All The Queen’s Horses, as they set off on the parade from 1pm onwards. 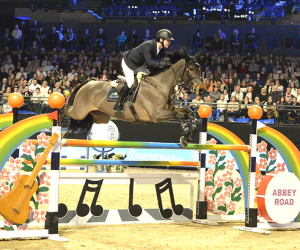 The world’s leading show jumpers will be out in force at this year’s Liverpool International Horse Show as they battle it out for a place in the prestigious Theraplate UK Grand Prix on New Year’s Eve. The Whitaker dynasty will be represented by elder statesmen John and Michael who are set to compete at this festive show jumping finale which will round off 2018 in style at the Echo Arena, 28th to 31st December. 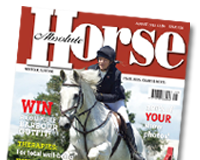 Leading British stars, Laura Renwick, Robert Smith, William Funnell, Harriet Nutall, Harry Charles and Nigel Coupe will be joining them to provide the very best show jumping sport in the run up to the New Year. 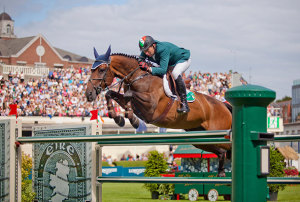 The show is always a huge draw for Irish riders and two-times Grand Prix winner, Billy Twomey will have plenty of support with Shane Breen, Anthony Condon, Michael Duffy and Conor Swail also in action. 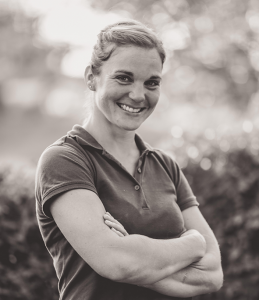 Overseas riders include Frenchman – Felicie Bertrand, Germany’s – Tobias Meyer and leading US rider, Andrew Kocher. The Sunday night Equitop GLME Puissance is certainly building to what looks set to be one of the hottest competitions of the show. Fighting it out for the leading awards are puissance specialists David Simpson, Mikey Pender with Hearton de Bois Halleux, James Smith riding Cycloon W, Nano Healy a winner of the Balinasloe and Cavan International puissance classes when clearing 2.10m and Michael Whyte another to clear well over 2m on the Irish scene. More than £7,000 was raised at Hickstead’s annual Showtime Ball on 17th November, with all profits from the night going towards improving the showing facilities at the showground. Around 150 guests from the showing community attended the glittering black tie event, which takes place in the Members’ Restaurant overlooking the famous International Arena. 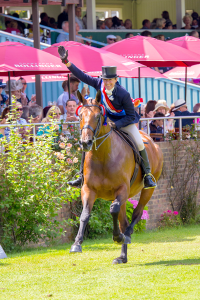 The Ball has been held each year since 2015 and has raised in excess of £25,000 since it started, allowing Hickstead to make a number of beneficial changes to the showing arenas at its international shows. One of the highlights of the evening was the presentation of the Roger Stack Award. Named after Hickstead’s former Showing Director Roger Stack, who sadly died in December 2016, the award is presented for the showing performance of the year. 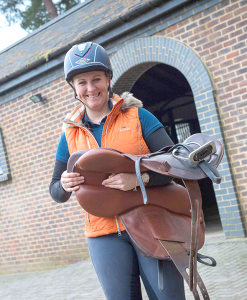 This year’s recipient was top show producer Jayne Ross, who has won countless titles at Hickstead including five British Horse Society Supreme Horse titles. Presenting the award, Hickstead Director Edward Bunn said: “If we listed everything Jayne has won, we’d be here for hours. She has won numerous championships and -supremes, and she’s one of our biggest supporters. She is a very worthy winner of the Roger Stack award. 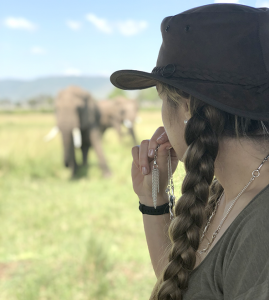 “We would also like to thank all the people who donated auction prizes, and everyone who came to the Ball and made it such a success,” Edward added. Above: Jayne Ross winning in 2016. Photo: Craig Payne. More than 250 guests attended a very special ‘Evening with Ramiro B’ at Bolesworth Castle in Cheshire to learn more about the many successes of this legendary stallion. 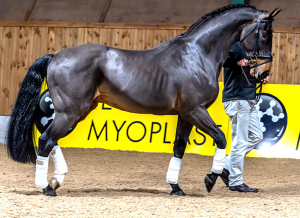 Hosted by his owner, Nina Barbour, the event allowed visitors to get close up and personal with the Belgian Warmblood stallion and gave those looking to breed with their mare next season the chance of a stud fee deal for 2019. Leading event rider, Oliver Townend, well known for his success with Ramiro B progeny then rode Laura Collett’s Advanced ride, Cooley Again. 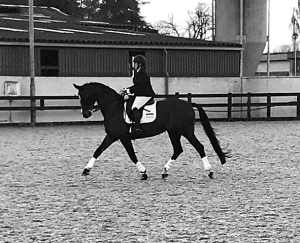 By Ramiro B out of an Irish Sport Horse, the 10-year-old Cooley Again is proving a very talented horse with Oliver relishing the ride as Laura is off with a broken hand. “I have been riding Ramiro B offspring for more than 15 years and he has been an integral part of my career,” said Oliver. 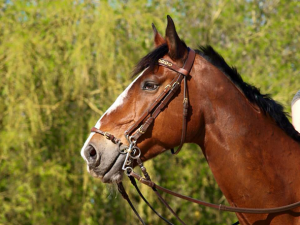 “He passes on his great temperament and is a real dual purpose stallion. Even if we don’t get a superstar, we get a lovely horse for junior or young rider level. Oliver then rode Cushlas Reviro, a 7-year-old, owned by Nina and destined for a career as a show jumper. By Ramiro B out of Cushlas Reve Du Lac, Bear as he is known at home also drew much praise from Oliver. Standing at Stallions AI in Cheshire, at 24-year-old Ramiro B is limited to 80 mares 2019.